SuperManager has long supported being able to export shipment information to shipping software and services for creating shipping labels. 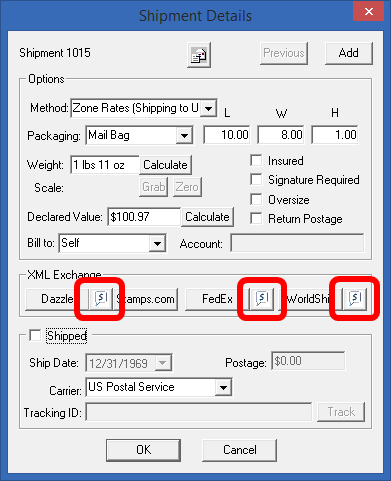 Most recently support for direct printing of FedEx shipping labels was added as you can read about here. With the release of version 1.6.9.0, SuperWare is happy to announce the ability to query shipping rates from all three major shipping providers – FedEx, UPS and the US Postal Service. This will allow users to compare prices for a particular package before printing a shipping label. You can select a ship method and it will switch to the ship method to one that is mapped to the selected ship class. If none is mapped to this ship class, a new one will be created and mapped to that ship class. In order to query rate quotes, you will first need to obtain and enter credentials for the web services for the respective shipping provider. See section 7.5 of the user’s manual for instructions on how to do that. You also may need to map package types as explained in section 6.8.f.